"My choice of colours does not rest on any scientific theory; it is based on observation, on feeling, on the experience of my sensibility"
I've only begun to use the book but I can see that it will be one that I'll refer to often. Working with basic DMC floss, Trish Burr uses actual stitched samples to take us through over 175 colour combinations, as well as over 120 samples of the use of colour compliments. There are over 20 pages of creative colour schemes with such imaginative names as "Under the Tuscan Sun" or "The Devil Wears Prada". "Highlight colours are not pure white but rather a very pale shade of the main colour plus a hint of the reflected colour. Sunlight reflected onto an object would give the colour a hint of yellow whereas a bluish light on a cloudy day would result in a grey tint." 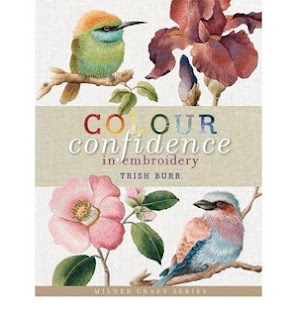 Then there are twelve step-by-step projects illustrating different colour usage, ranging from florals such as the "Iris Spartan" to bird portraits such as the "Sacred Kingfisher". The illustrations from cover to cover almost turn this into a coffee-table book. Even non-stitchers will be thrilled to browse through it. Usually I like to see a book first-hand before I buy it but this one was sight-unseen and I couldn't be happier!